On Wednesday 16 May 2012, Hangouts with the help of +Hermine Ngnomire took a step forward in the Operating Room. What you will see circled is a Logitech C910 Webcam mounted on a medical stand and two laptops streaming to the hangout a Thyroidectomy procedure. Dr +Gary Levin was in the hangout to share his medical expertise from San Antonia, Texas also pictured are +Dan McDermott +M Monica and +Mike Downes. As Gary Levin writes, This show seems to have attracted a lot of interest, there will be more soon. Some of the surgeries will include open heart surgery, a brain surgery, ocular surgery, a lung transplant. The upcoming schedule will be on +Digital Health Space. The goal of these broadcasts is to educate and give patients more exposure to hospital environments. The patient asked me to tell you to have your thyroid checked regularly. Here is the 81 minute video. Watch out for the Thyroid removal at 1 hour 9 minutes with a handshake between the Surgeons. There is a slideshow of twenty two photos that were snapped during the live show. There has been a phenomenal amount written about this event as it takes a once unseen area of our lives into the public or private eye. Holding a Hangout from the delivery room would be wonderful for any family to see the latest newborn addition. It was fantastic to see this last night on the Sarah Hill Show where a proud father showed his baby to the world. Sarah writes, Coolest Hangout Moment Ever .. Minutes before today's Noon newscast, +Thomas Deliduka joined my Hangout to report he had "breaking news". Thomas was in a hospital room... he panned the camera down to reveal his newborn daughter! Congrats Mr. and Mrs. Deliduka. Thanks for letting us share in your joy of child #8! 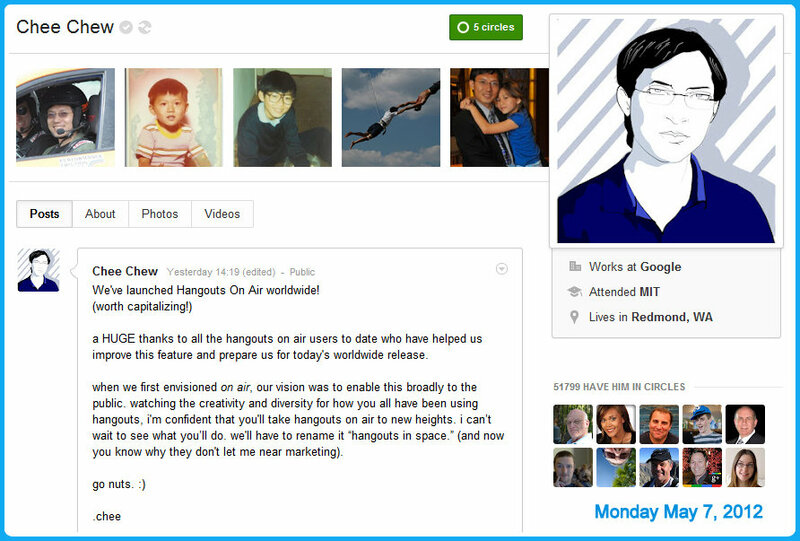 Here's a look at What Google Insights can show us about Hangouts On Air. We can see that web interest has really started to grow in the last few weeks. Chee Chew made a post at Google Plus yesterday (Monday 7 May 2012) at 2.19 pm UK time. It said, We've launched Hangouts On Air worldwide! .. go nuts. 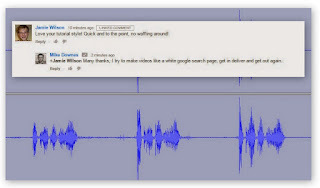 :) Viv Gundotra followed that four minutes later with Broadcast your Hangout to the World! Eight minutes earlier at 2.11 pm, Chee posted to the Official Google Blog which in my mind is one of the most important posts in Google history as it details how anyone, for free, can broadcast not just one, but ten videos LIVE at Google+ and LIVE to YouTube. This post gave eight videos and tons of links. Not everyone was happy as the world is a big place and it takes time to organise each country. Google produced a Country Guide to Hangouts On Air Availability and links to Learn More. I was delighted to see so many people I know featured in a Google+: Broadcast Your Hangout To The World video. Google Plus was opened on the 28 June 2011 as invite only with it going public on 20 September 2011. Many of these people I've know for over nine months: +Hermine Ngnomire +pio dal cin +Daria Musk +Larry Fournillier +M Monica+Maria Quiban and +DeAno Jackson. Over the next few hours, many people who were fortunate enough to have early access started broadcasting for the very first time. What I find puzzling is the UK Media. Britain is one of the most developed countries in the world. Yet for some reason, Google Plus (and the +1) button are irrelevant. Here's an example from the BBC where 24 hours on and news that everyone will have the ability to broadcast LIVE (for free) has been unreported. Even The Guardian have passed it by. have a look yourself .. and yes a Google News Search is far the best way.